In December, a woman reached out to me about repairing a cherished piece of "flow blue" pottery. I hadn't heard of this style but learned that it was popular in during the Victorian era and is recognizable for its blurry blue patterns. In addition to the actual value of this plate, the sentimental value to her was quite high and she was devastated when she broke it. 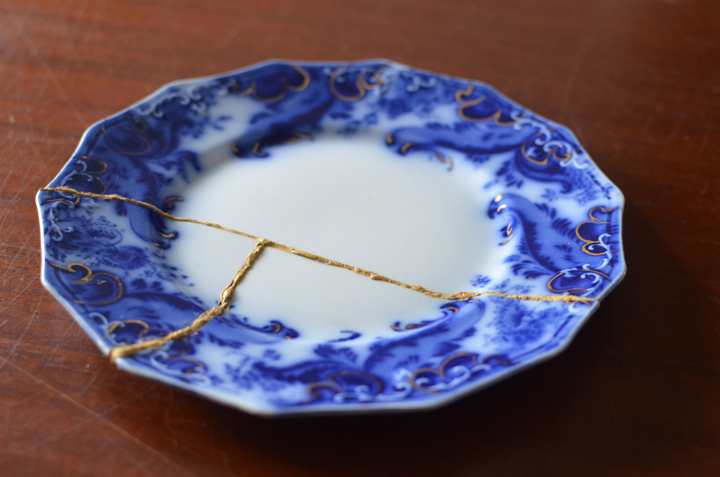 We talked about the Japanese art of Kintsugi where broken pottery is repaired with lacquer and gold powder. The breakage and repair is honored through this process, making it a part of the history of the piece, embracing the flaw rather than trying to disguise it. I was pleased that she asked me to help her but had to do quite a bit of research to figure this out as pottery repair was not something I knew much about. Hooray for YouTube! I discovered a product made by Swarovski called "Ceralun" which is a gold epoxy clay. After running a bunch of tests on some broken pottery of my own, I figured out how to create a beautiful, thick gold seam which now runs through this lovely cobalt blue pottery. It highlights the break and also brings to mind how things that are damaged can be brought back together again through patience, time and effort.